Panel from day one of “Sculpting the Architectural Mind”. From left to right: Philip Beesley, Sanford Kwinter, Lawrence Blough, Michael Arbib. Photo by Melissa Marsh. Neuroscience of the design process looks at the architect’s brain activity in the development of a project. Neuroscience of the experience of architecture involves how users experience the built environment from a neurological perspective. Neuromorphic architecture exists at the intersection of biophilic design and smart buildings (buildings that begin to take on aspects of living, learning, and knowing). A slide from Mallgrave’s presentation, “Embodied Simulation, Emotion, and Architecture”. Photo by Melissa Marsh. The human evolutionary foundations of our current preferences is of special interest to Harry Francis Mallgrave, professor and director of the International Center for Sustainable New Cities at the Illinois Institute of Technology. For laypeople (especially those with a penchant for history amidst dizzying algorithms, inventions, and neurological mechanisms), his work is helpful in piecing things together, starting with a simple timeline of the neurological evolution of the human brain and our related cognitive comfort with certain arrangements. We evolved in communities of 30-50 people, likely learning to speak, pantomime, and tell stories around a campfire. We spent a great deal of time on the plains, seeking rocky areas and clumps of trees for shelter and sustenance. Hence, it is no wonder that we fear thickly wooded forests (or seas of high cubicles!). We prefer our vistas with clear sight lines, as in the landscape paintings of the 18th-20th centuries and landscape designs from Stourhead in the UK to Fredrick Law Olmsted’s work. One of the more talked about modern discoveries in neuroscience—and one that has an especially juicy intersection with the built environment—is the understanding of mirror neurons. These are “neurons that fire both when an animal acts and when the animal observes the same action performed by another.” They likely play a major role in our understanding of the actions of others, and in the learning of new skills through imitation. In terms of the architectural experience, mirror neurons give us two important lessons. First, education-wise, there’s the importance of seeing one another in order to learn, build trust, and translate behaviors. Second, they form the basis of empathy and therefore of the ability to work better together and design environments that will best suit others’ needs. Similarly, embodied simulation (or “embodied cognition”) plays two roles from a design perspective, according to Mallgrave. One is our ability to map the experience of something that we see onto our own skin, like the image of a frosty vista making us feel cold. The other is focused around the power of hand-wrought materials in architectural design. When we see a stone carving, we can’t help but think, how was that made? What was done by chisel? What was done by sand paper? In doing so, we also imagine ourselves as the actor in this creation, thus creating a pause, and a deeper relationship to the object or the environment. 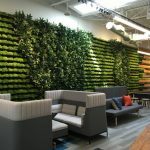 Translated to the workplace, these ideas could go a long way in helping employees to feel more engaged with their environment, and could help companies brand themselves in space in a more resonant way. Philip Beesley’s Epiphyte Spring, an installation shown at the Hangzhou Triennial of Fiber Art in Hangzhou, China, 2013. Image via Philip Beesley Architect Inc. Virtual reality represents a growing opportunity for understanding and anticipating human reactions to the built environment, and potential impacts of future forms before they are built. Eduardo Macagno, Distinguished Professor of Biological Sciences at UC San Diego, discussed some technologies that are making this possible. These exciting developments could help designers test out their projects before they are built, allowing for adjustments based on how people will really experience an environment. However, one criticism of virtual reality tools is that they do not capture the full multisensory experience of humans in the built environment, ignoring the fact that our minds and bodies are tracking an exceedingly wide array of stimuli. This critique extends to the modern architecture profession as a whole being overly focused on the formal or visual experience. 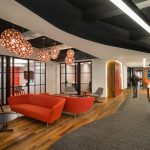 In any built space – particularly those where we spend a lot of our time, like in the workplace – it’s important for designers to address the varied needs and experiences of occupants, not just whether a space is visually pleasing. By working towards a better understanding of the scientific principles underlying the design and experience of the built environment, we can improve our processes and output from a human perspective. Wayfinding is one important aspect of designing for the multisensory experience. Macagno explored attempts to achieve successful wayfinding through signage and form-making in the built environment, pointing to a proliferation of wildly unscientific attempts by designers to provide direction in confusing environments. There is clearly much room for improvement, but some tools have been developed that help us understand how others navigate environments, a promising step in the right direction. For example, the MIT Age Lab’s AGNES suit allows the wearer to experience the “motor, visual, flexibility, dexterity and strength of a person in their mid-70s.” Other advancements in multisensory design that were discussed included Cognionics, a company founded by a UCSD Ph.D. student that makes biopotential sensors, and installation and sculpture work presented by Philip Beesley. Used correctly, these tools could greatly advance our attempts to design empathetically, especially in environments that are shared by a diverse group of people. We imagine this exuberant use of recycled lumber at WeWork Charging Bull in NYC gives the community all sorts of feels. Image via WeWork. The historical perspective presented at “Sculpting the Architectural Mind” suggests that an absence of neuroscience in architectural education is but a blip in history; that the sensibilities of architecture and landscape designers of the pre-industrial area had much greater focus on every aspect of human nature in the built environment, from framed vistas, to relaxing cloisters. From biophilia to circadian rhythms, design has only recently “forgotten” these elements. The tools and evolving perspectives offered at this event and beyond show that we are beginning to return to this way of thinking; this year, the Nobel Prize for physiology or medicine was awarded to a team of scientists who discovered that our brains have a “GPS system” of grid cells, going far beyond what we formerly thought of as a sense of direction. With these advancements, we may be facing a golden age of architecture and neuroscience. Truly recycled lumber is likely to be cut by hand or small machine, correlating to corporeal scale and visual experience of architecture. The wood itself delivers both visual connection to images of nature and natural/biophilic fractal patterns in the wood grain. The worn look and expectation of re-purposing is symbolically authentic and sustainable. The extreme texture of the wood surface can also refract and diffuse sound, solving for one of the biggest problems in many contemporary environments. Recycled wood, therefore, satisfies several aspects of the multisensory experience that please occupants. By working towards a better understanding of the scientific principles underlying the design and experience of the built environment, we can continue to advance the use of such materials, and other neuroscience-related design elements, to substantially improve our design processes and output from a human perspective. “Neuroscience of the experience of architecture involves how users experience the built environment from a neurological perspective”. I am a sociologist who studies how the built environment impacts our perceptions of power and status- especially in the task focused workplace. Research shows that physical environments due indeed influence power/status relationships. The corner office being the poster child of high status/high power. Taking this a step further, those relationship differences are correlated and associated with neurological processes. A good design is more than pleasing to the eye, it is also pleasing to the brain and we feel it as a human emotion. A recognition of this relationship (environment – power/status – emotions) need to lay a larger role in our design practice. Good work, do more ……. We are Kolektif House, an inspiring coworking space for creative individuals and boutique companies. We have opened our first location in İstanbul 3 months ago, and now we are planning to grow in to several other locations. For our new location we are rethinking every single element that goes into answering our big question, “What makes the most creative and productive office environment?”. In our attempt to answering this question you definitely stood out as a strong reference point. I would love to start a dialogue for investigating how we could create some synergies. Although I am not a member of the Work Design Magazine staff, I am a frequent contributor. I would be very pleased to open a conversation with you about the design and operation of “co-working” spaces. I’ve done considerable work here in the US and some in Europe on this topic. If you are interested in a discussion please email me directly at cegrantham@gmail.com.